When I was growing up my mom kept a container in the fridge labeled “Hog Casings” in which she kept safe any leftovers she thought my dad might hoard for himself. It’s funny now to think that her method was clever survival, resourcefulness and self-preservation while my dad’s was greed, gluttony or sneakiness. Sometimes he would shamelessly claim certain praised items while shunning the things the rest of us were forced to eat. Heck, he might even cheers us, oblivious, while happily smacking his lips after the last bite of a coveted morsel. So I certainly don’t blame my mom for her ingenuity. Unless hog casings are wrapped around some awesome ground meat, it’s not anything anyone in their right mind should take a closer gander at. So what were the best of the best leftovers worth hiding carefully in the offensive plastic tub? Why chicken cutletkis of course. My dad’s version of a legendary family specialty. A minor production involving the meticulous boning of some chicken breasts, two turns through the meat grinder, a tossing with breadcrumbs, egg, parsley, salt and pepper, a final dredging in yet more crumbs and a final fry in a generous puddle of olive oil and butter. But it was not the coveted cutletkis alone that made the meal. Most often they were served with broccoli and hollandaise, a sauce prevalent in my youth and marked by either triumphant delivery on a wooden spoon straight from the glass double boiler or a two-day sulk born from curdled failure. More often than not the sauce, somehow extra powerful in both balancing elements of egg and lemon, was a thick and mouth-coating success. And the holy trinity of juicy, crispy cutlet, fresh, green broccoli and fatty, zesty sauce would form the platform of comfort food of all my days. After years of making cutletkis the family way I have branched out with various seasonings and pairings, though the basics remain the same. The original version involved soaked bread that probably was chopped precisely in a bowl similar to that which makes gefilte fish…but my dad’s version used a slurry of breadcrumbs, eggs, parsley and a hefty load of salt and pepper. And while I got many, many lessons in boning chicken breasts during cutletki preparation, my dad’s world changed once ground chicken appeared in the grocery store. Funny thing is that I now choose to grind my own meat out of fear of what might be mixed in. Plus there is something nostalgically gross about forcing meat through a grinder. Watching it squirm through all the little holes and occasionally go POP! while a small bit flies through the air. There is really no cleanup like post-meat grinding clean up and yet it is a calming activity for me…knowing exactly what is in the ground meat I will eat and taking good care of the tools that made it. Almost the same fondness I once had for the large, scary meat slicer we owned (an anniversary gift from my dad to my mom which was not exactly what she had in mind). It had been quite a while since I had made this dish and I decided it was time my daughter became familiar with it. So I bought some chicken breasts, ground them up and began to ponder the panade, a bready mixture that would be folded in. I know my dad would never have added onion or garlic powder, but I like hints of both. So I tossed together some bread crumbs, both seasonings, an egg, some milk and some salt, pepper, and chopped parsley. I fried up a test piece to taste and it was good, but something was missing and I realized I had done the test just in some olive oil and the flavor ribbon tying it all together was the butter. A good-sized puddle of butter and olive oil to add a rich, nutty toastiness to the outer crumb. I skipped the hollandaise this go around, but did serve up fresh broccoli and tomatoes from the garden and some incredibly sweet roasted potatoes. 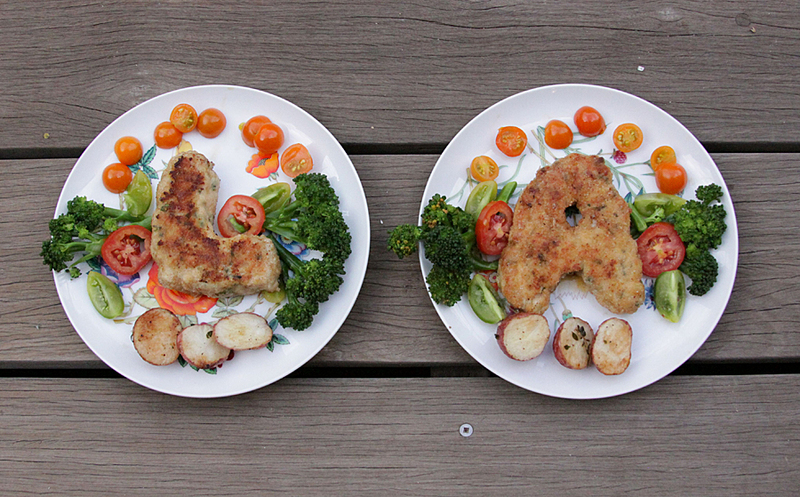 My daughter and her friend ate like champs and I don’t think it hurt that I shaped their cutletkis in the letters or their names…A and L respectively. 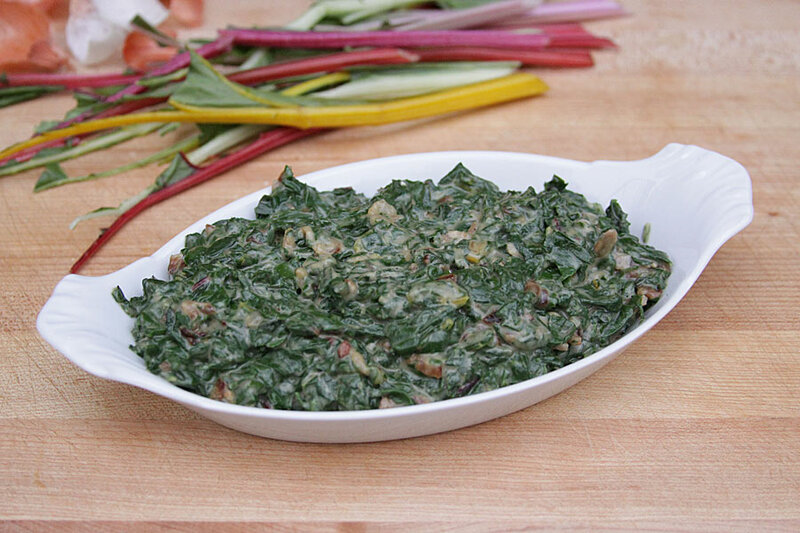 The next day I realized just how much swiss chard I had in the garden and decided to make a big vat of creamed chard. It occurred to me that creamed spinach was often the other main companion of the cutletkis of my youth. And having plenty of leftovers, it was an obvious pairing for the next day’s meal. So I cooked up some bacon and onion, blanched an armload of chard, made a roux-thickened white sauce, folded in the chard and some parmesan and had wonderful meal #2. The next morning, Ryan heated up a cutleki halved lengthwise with some chard and a fried egg for a rockstar breakfast. And the final meal was a hasty, work-day affair. I heated the remaining cutlet in a pan and made a quick sauce by mashing some roasted garlic with mayo and sriracha. I topped it with a soft boiled egg, a lot of pepper and a few of those amazing new red potatoes. And this is the flip side of the meals I try to make look pretty. This is pure greatness on a plate in its ugly glory. (I did not eat all that mayo btw). I got my fill of cutletkis (as did Ryan and Audra) without having to hide anything from anyone. I did have a silly vision of freezing some for future use but I just don’t tire of this dish and neither, it appears, does my newly initiated family. Trim chicken breasts of any “grooze” or fat etc. and put through grinder OR buy some ground chicken you can trust. Mix egg and milk in a measuring cup and add breadcrumbs to make one cup. Stir in parsley, onion and garlic powder and some s&p. Fold into chicken mixture. Form into patties, coat in more breadcrumbs and fry in an equal mixture of butter and olive oil. You want enough that the patties don’t slurp up all the fat right away….maybe 1 1/2 T. each for two batches. You also might want to test a bit before forming all the patties. Remove stems from chard and roughly chop. Blanch in salted water for a few minutes. Rinse until cold water until you can handle it and squeeze out the excess water. Chop finely. Warm milk. Cut bacon into small pieces and render until brown. Remove to a paper towel. Pour off all but 1 T fat and brown shallots. Add butter until melted and whisk in flour and stir for a few minutes. Add warm milk, whisking until thickened. Stir in nutmeg, parmesan and s&p to taste. Fold in chard. 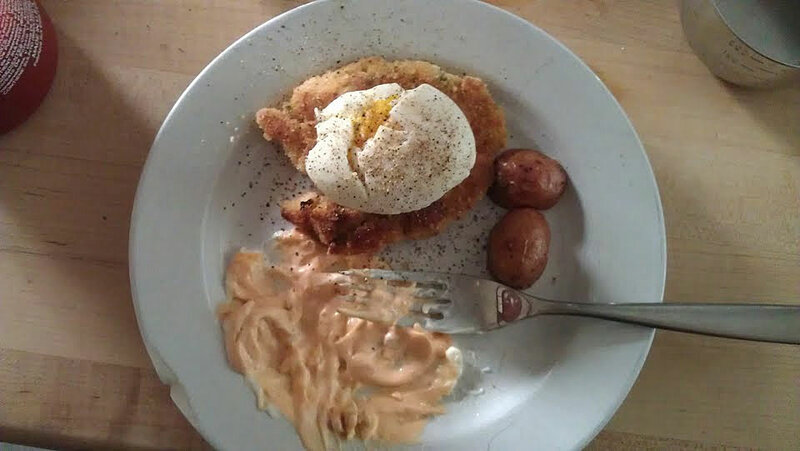 This entry was posted in Blair, Chicken, Leftovers, My Favorite Things by Marina Chotzinoff. Bookmark the permalink.